Winter has been with us for some time: blustery, wet and cold. Warm clothing is a must if you want to enjoy the great outdoors. So here’s my long-term test review of the Alpkit Filo, a jacket which has received much acclaim for its relatively low price and its relatively high warmth. How does it perform in the field? I bought this jacket during the winter of 2012/2013, to be honest I can’t remember exactly when, and I’m pretty sure it cost me £80. So the current price of £120 is a bit of a hike, if you’ll excuse the pun. At that price, you’ll need to compare it against the other good quality down jackets from places such as Cotswold Outdoor and make up your own mind. At the time, £80 for a warm jacket was exceptional value. But price is comparative, warmth and usability are not. So, how well has it served me this past year? Brilliantly, but not perfectly. Let’s start with the positives. This jacket replaced a Trespass down jacket which I’d had for a few years and was getting a bit long in the tooth. To be honest, the Trespass jacket had never really delivered as a down jacket should but it was, if I recall, really quite cheap and as it’s less puffy than others it works better as an everyday coat. The Filo is made of shiny poly material on the outer, ultra lightweight and packable but, in use, quite bulky as the down does its job and puffs the jacket up nicely. It’s really nice and snugly, if that’s a professional term to use in an outdoor gear review, and warm too – though on a cold day I wish it were warmer! I suspect that’s just me wanting the moon on a stick, but without a range of competitive jackets to compare I can’t give a better rating than that. The pockets are great, they take your mitts inside the down and against your body so your hands get instant warmth. There’s one large internal chest pocket, which unfortunately you need to unzip to get at. The hood attaches using poppers, so is easy to get rid of but, as its down too, you’re quite likely to do so and then find that it’s not with you when you need it. I think I’ll have to blame that on user error though, rather than Alpkit. The rear of the jacket comes down over your bottom – or, at least, over my bottom – and all round the jacket drops to a generous length so as to keep your upper body properly warm. It’s bulky, so you do feel a bit like the Michelin man, and of course it’s not waterproof so it’s not an ideal jacket for a rainy day. It does shrug off the odd light shower well, but I’m always wary of going out in it when there’s rain forecast as I don’t want to spoil the down. Paired with a waterproof outer layer (I have an old Berghaus which is on the large side and fits well) you feel even more like you’re made of tyres, but in fact on a cold day the extra layer also helps to keep wind out – so I suspect that the lightweight outer fabric of the Filo struggles with the wind, despite the very tight weave. The only real downside with this jacket, the only thing which I’d call a flaw rather than simply a facet of the design constraints of a lightweight down jacket, is that the zip sticks. Maybe it’s just me, and Alpkit have sewn in a recent bit of tape which is meant to stop the fabric getting caught in the zip, but it sticks nearly every time – not always due to fabric inserting itself either. Why should be I have not managed to work out. Also, the zips have stupidly (yes, stupidly!) been given fasteners which can be accessed from both inside and out – the bit you get hold of to pull can flip from one side to the other. On the pockets, too! My hands are never on the inside of my jacket, nor on the inside of my pockets, when I want the zips closed! This is especially a problem on the pockets, such that the pull-tab usually flips into the pocket making it hard to find which you need it. A silly design flaw. All in all a nice, warm, comfy – snugly, even – jacket for cold and dry conditions, usable in the wet with a waterproof outer, which does stretch your wallet quite so much as some of its competitors. 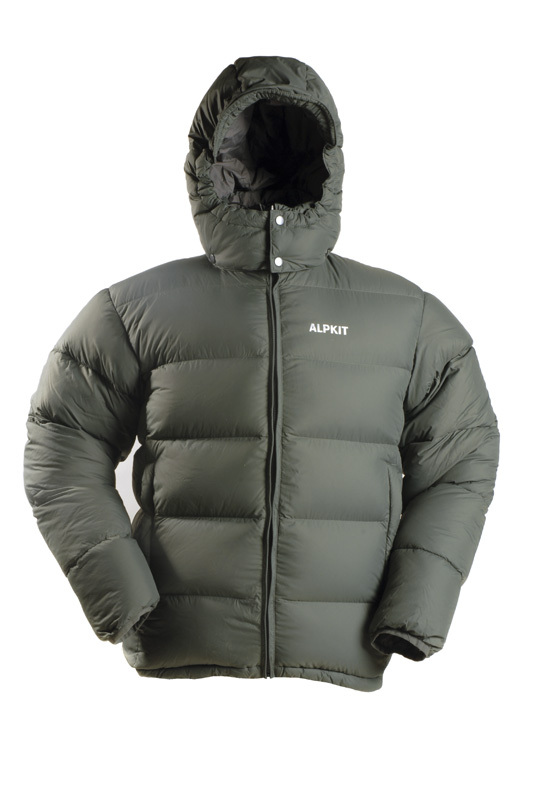 But you might consider waiting, as you’ve waited this long, to see if Alpkit’s legendary stock problems leave them with any jackets to sell off when the weather warms up. Grabbing a bargain for next winter might be your best bet.